I come to you as one who has traveled miles and miles through the long, bitter cold night in the darkness of the wilderness. The soft glow from your window pane summons me. It has taken forty-four years (and lifetimes more) to arrive on your doorstep. I approach, so very humbly, kneel before you, and ask you to pause with me for a short while. I offer the following in exchange for your warmth. I am your tribe, your family, your fellow traveler. I kneel not only for you and me, but for the great, great, great, great, great grandchildren yet to come. For the water, land, air, birds, four-legged creatures, insects, life. Grant me this deep eye contact before I journey back into the night. The dance of lightness and darkness is a fluid interplay. Light transforms into dark and dark into light in an eternal exchange as the transformative spark carries itself through the fluid medium of the universe like phosphorescence in water. Lightness and Darkness: Seen, unseen. Life, death. Day, night. Expansion, contraction. Awake, asleep. Lightness and darkness—both children of god. They do not exist independently of one another. Within the neutral tapestry of eternity, there is no preference for light or dark. In the absolute sense, this is the nature of the manifest universe. A churning furnace filled with intense light burns stars while vast black holes teem with seeming emptiness. In the unfurling sacred dance of the infinite light and dark transform, transfigure, and become one another. None of it is personal. This dance, this sacred unfurling, also occurs within our flesh as the whirring orbit of protons, neutrons, and electrons around the nucleus of every atom in our being, and as the profound stillness that underlies it. The fabric that birthed eternity occupies and gives rise to us also. It resides within as the unseen bedrock of pure potential of all that is. The bedrock of pure potential within transforms into lightness or darkness depending on the state of our awareness, our consciousness. We too are children of god. Our ability to create is every bit as magnificent. Both lightness and darkness are essential for human life. It is within the warm humus of the darkness of the womb that the profound miracle of life germinates. It is by the light of the sun that our food is grown through the absorption of light waves by chlorophyll—plants drink sunlight to become our food source that becomes our tissue. Our exquisitely delicate biosphere is maintained (as we hurl through space at unimaginable speed) by a delicate balance between light and dark. The intelligence of it all is unparalleled. We walk a fine balance—a gentle sway it has been said—between light and dark both within and without. In the absolute realm of (seemingly) distant cosmos, birthing galaxies, and suns burning out after billions of years, there is no preference for light or dark, for anything over anything else. The unfolding on that scale occurs over eons as something gives rise to something else, in a profoundly neutral unfolding. Our powerful awareness—one that arises from the bedrock of our presence and is in continuum with totality or all-that-is at all times, whether or not this is apparent—maintains the balance of light and dark in the psycho-spiritual-physical or relative human realm. The human realm tends to lose the neutrality of the absolute as the denser structures of the mind give rise to good/bad, right/wrong (even as that which gives rise to the mind is itself profoundly neutral, the stuff of totality). The gift of human consciousness comes with the responsibility of exquisite stewardship, which means bringing awareness to the massively big picture that arises from within and is projected outwardly into the collective. While arising from the absolute cosmic realm of no-preference or neutrality, we are designed to care very deeply, to preserve life, to love one another. It is hard-wired into our instinct to survive. Our survival depends on it. The potential within us is to feel—exquisitely so—the nameless, timeless, unbounded, powerful expanse of love within and without that unites us with each other, all of life, and the eternal (separation does not exist save for in the shadows cast by the veil of the mind) while we walk and breathe as humans on earth. It is that which builds bridges instead of walls and transforms me into we. That which quells self-importance—self-importance that is a malignancy to the organism that we are. That which calls our attention to the air, water, land, and all of life. This love vibrates from within the light and the dark. It can be the source from which our thoughts, words, and deeds arise. It loves unconditionally from its still, silent presence—one that is not perceived by awareness made murky from the sludge in our tissues from toxic chemicals in food or the environment, from densely obscuring mental distortions, or an attention span curtailed by over-externalization. It takes exquisitely subtle perception—one deliberately cultivated—to feel the immensity of it within the air we breathe, the ground upon which we walk, the leaves that whisper overhead, the clouds dancing in the wind, the emptiness of the darkness of night. It is heard in the haunting call of the owl from the nightscape, in the voice of the ancient that sings from the flute, and beckons in the beat of the tribal drum. It emanates from the spider poised in absolute stillness in the center of her exquisitely fragile web. The pure potential of all-that-ever-was-is-or-will-be vibrates within us. It vibrates from within the light and the darkness. It is our birthright because we are it. The essence that is hard-wired into every aspect of our being—one that begs our knowing—becomes obscured within the shadows when the balance of the light and dark are not maintained. It becomes obscured beneath the toxic load in our tissues, and beneath psycho-spiritual-mental distortions (often a result of our and/or ancestral trauma—one and the same, really) that give rise to fear, cynicism, mistrust, misdeeds, and their offspring. The divisive distortions have been passed down generationally through ancestral lineage for millennia. They are, breath by breath, threatening humanity’s shelf life, creating profound isolation, making us and our Earth very sick, and nurturing a collective that gives rise to humans killing humans, and a “me vs other and us vs them” mentality that is not on any level congruent with harmony and survival. What occurs within occurs without. What lies hidden from view within the shadows of the landscape of humanity (not in a bad or wrong way, simply in a it’s-how-it-is-way) has the power to destroy human life and with it a significant amount of other life. That is one of the distinct possibilities of our current trajectory. What is obscured by the shadows within is the highest form of invitation. Bringing subtle awareness into the temple of being to discover what is there is no small task. It is however what is required. Not when there is not enough oxygen in the biosphere to support life as we know it any longer, or no clean water to drink, or when daily a human opens fire on other humans such that we’ve grown numb to it, but now. It requires shining a light on what is happening both within and without. Looking at how our choices—ones that are often unconscious—are impacting one another and our beloved Earth on whom we rely for survival. It requires choosing to wade into deep discomfort within that many aren’t aware is present due to over externalization (we externalize as a mechanism to protect ourselves from pain) and a gross perception (as opposed to subtle) that prevents conscious intimate contact with or awareness of it. The process of staying with—maintaining awareness within the uncomfortable contractions, tensions, or other sensations that occur in the heart center, chest, belly, or wherever they show up and/or maintaining awareness on the sensations of the inhale and exhale, in a continual return from rumination back to the sensations of body or breath, a process from which arises insight and deep wisdom with regard to habitual mental patterns and energetic patterns buried within—is how the powerful muscle of awareness into ourselves and the greater unfolding is cultivated into our ally. Rumination is seductive and costly. It takes significant strength and determination to unstick our awareness from well-worn pathways of story we’ve unconsciously created and unknowingly perpetuate with regard to our grief, sadness, anger, rage, jealousy, etc, to the reality of the present in which we find ourselves, and stay with it. This process is the alchemization that pressurizes the carbon into the sparkling crystal clarity of the diamond. Our presence literally is our superpower. A very wise person once said that if you turn a light on in a dark room the darkness must go away. Within the womb of darkness germinates the miracle of new life, the ground of infinite possibility. When we uncover what lies hidden in the shadows within we no longer project blame, dissatisfaction, or responsibility for “the way things are” onto other. At the level of totality there is no such thing as self and other. The experience of self as separate from other and separate from the rest of life is an illusion that subtle perception burns right through. What we project outwardly onto any form of other is merely a reflection of what we’re (often unconsciously) perpetuating within. When mired in thick underbrush reality appears a certain way. When liberation occurs such that one is afforded the internal freedom to travel from the underbrush to the top of a distant peak, reality is drastically altered. So it is within as what is buried in the shadows is illuminated, liberating us from ancient chains that have plagued humanity for eons. Whether or not it is apparent from your perch, our shelf-life on earth is at stake. At the level of the absolute (from whence we’ve come)—the level of the cosmos, black holes, burning stars, and birthing galaxies—whether we survive here for any duration is of little consequence. It matters to us, however. 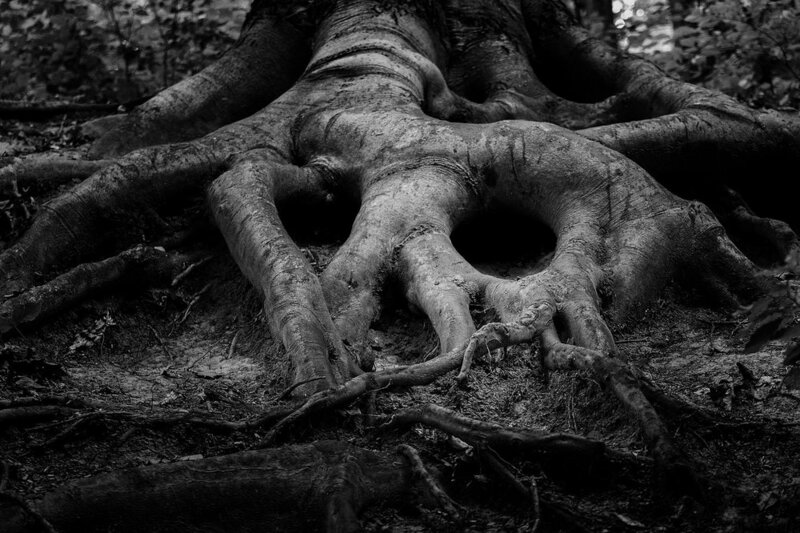 The ancient chains are broken by feeling, by alchemizing, what our ancestors could or would not. It is hard-wired into our DNA to care very much. To care for the air, land, water, animals, and each other. To build bridges, not walls. If your child, mother, father, sibling, dearest friend, or animal was trapped in a burning structure I am certain it would get your attention. If you saw the firemen doing nothing as the house was actively burning around your loved one (or unknowingly fanning the flames), would you stand far away and spectate, turn and walk away, or might you move much closer to investigate your role to assist your loved one from the burning fire? We are there. Our loved one in the burning house is each of us, all the children yet to come, and life on earth as we know it. We are in this together. We decide how our precious human story unfolds, consciously or unconsciously, breath by sacred breath. We keep the balance of light and dark. Darkness is not an enemy. It is the place where the germination of the miracle of life, of possibility, occurs. We decide what germinates there. No one else. It is time to open fully to the shadows present within in order to bring light to the shadows that are seemingly without. It is time to stop looking outside, projecting blame, and damning others for what lies within their shadows, which is merely a reflection of our own. Though uncomfortable, this journey alone is what reveals to us the essence of what we are. It is a journey we make alone, together. It requires getting up close and personal—aye, inhabiting for as long as is required—the places that feel painful and contracted within, and the places we can’t yet feel. It requires touching the void. There is no quick fix. It is indeed a very exciting time to be alive. The potential is rife with infinite possibility. The miracle is already here now. The responsibility that came with the gift of human consciousness ought to be taken very seriously. Our now is the heaven or hell that we decide it is, whether that decision is made knowingly or unknowingly. The alchemizer is our presence. It is cultivated in silence, in stillness. Just like splashing the dark water to reveal the exquisite phosphorescence inside. When our still and quiet presence inhabits the painful parts and the shadows (our own and others) holding a loving presence patiently, persistently, and without judgment, the phosphorescence within illuminates itself and burns distortion clean. Every time we bring our awareness, our potent consciousness from thought, from rumination, from judgement (of self and other), projection, or transference back to what is occurring within (which is synonymous with bringing it back to the present moment), the splashing phosphorescence grows stronger, bigger, and shines brighter light and more love. Hairballs of mental and physical distortion untie themselves as new mental pathways are laid. The thinking mind doesn’t give us the flashlight for the journey within. This journey creates the healing that we so desperately need and want. Since the past, present, and future are all happening now, solutions to what we face are already here. One of the many gifts of being human is the ability to begin again, right now. When humanity is gone, the earth—with her powerful life-force—will, over millennia, begin the slow process of repair. Fungi, mycelium, and the anaerobes will clean up the catastrophic mess we’ve created. New life will emerge from our darkness. With the time we have left here, however long it may be, we have the option to step up and act like the human family that we are. To assume responsibility of stewardship of the earth, of life, and each other that we signed up for with the gift of human consciousness. We are children of god, the alchemists so delicately weaving the balance of light and dark into our human story breath by breath. It is such a beautiful story, tragically so. On whom are we relying for our human birthright to love one another beyond borders, to care deeply, to protect our earth, to survive? Perhaps it is time to spend quiet time in nature, in front of a candle, in deep silence going within the temple of being and receiving the powerful guidance that percolates from the ethers when things quiet down there. Ask for guidance. All of eternity is poised and listening. Your human tribe is here with open arms, eyes wide open, and unconditional love. Believe in yourself because the power of creation is within you. When buried in the shadows, away from the light of understanding of our awareness, our power can distort and create mental patterns that wind into hairballs of self-doubt, mistrust in the all-that-is, deep fear, cynicism, utter outward projection of suffering onto other, and result in the unconscious destruction of life, our planet, and each other. The prevalence of anxiety, depression, and dis-ease speak to this. When brought into the light of our awareness, our presence alchemizes those hairballs and contractions into the love that we are, and the experience of peace and unity with all of existence. This is one of the infinite possibilities present within the ground of potent bedrock within us. We need each other as we unfurl our human story breath by breath. If you need guidance or resources, reach out. Who am I? I am a writer, a nurse turned nurse practitioner who has taken intimate care of the infirm for over twenty years. My hands have been more soiled than you care to think about. Like most of us, I am on a journey of healing, of acceptance. More importantly, however, I am your human tribe, your family, your fellow traveler. I am a student of deep silence. A child of the eternal. I am your grandmother, grandfather, mother, father, child, grandchild, sister, brother, closest friend, deepest ally, your enemy. Your student, teacher, servant, and master. I am the light, the dark, the day, the night. Dusk. Dawn. I am the steady chirping of crickets on a summer eve, the coo of the mourning dove, the hawk soaring over-head, the large cat in stealth-like pursuit of prey, the gentle summer mist, and driving spring rain. I am the crackling fire and bitter snow, the rainforest and the desert. I am the whispering grasses on the plains and the crashing ocean waves. I am life, death, the sun, and moon. Like you, I am everything and nothing. Lightness and darkness are both children of god. Neither can exist without the other. Within the neutral tapestry of eternity, there is no preference for light or dark. In the absolute sense, this is the nature of the manifest universe. There are burning stars and vast black holes filled with emptiness in the unfurling sacred dance of the infinite as light and dark transform, transfigure, and become one another. None of it is personal. This dance, this sacred unfurling, also occurs within our flesh as the very spin of protons, neutrons, and electrons around the nuclei of every atom in our being, within the whirring of our energetic field, and as the profound stillness that underlies all of it. The fabric that birthed eternity occupies and gives rise to us also. It resides within as the unseen bedrock of pure potential of all that is. The bedrock of pure potential within transforms into lightness or darkness depending on the state of our awareness, our consciousness. We too are children of god. Our ability to create is every bit as magnificent. Both lightness and darkness are essential for human life. It is within the warm humus of the darkness of the womb that all of life germinates. It is in the light of the sun that our food is grown through the absorption of light waves by chlorophyll. Our exquisitely delicate biosphere is maintained (as we hurl through space at unimaginable speed) by a delicate balance between light and dark. The intelligence of it all is unparalleled. We walk a fine balance—a gentle sway—between light and dark both within and without. In the absolute realm of distant cosmos, birthing galaxies, and suns burning out after billions of years, there is no preference for light or dark, for anything over anything else. The unfolding on that scale occurs over eons as something gives rise to something else, in a profoundly neutral unfolding. Our powerful awareness—one that arises from the bedrock of our presence and is in continuum with totality at all times, whether or not this is apparent—maintains the balance of light and dark in the psycho-spiritual-physical or human relative realm. The relative human realm loses neutrality as the denser structures of the mind give rise to good/bad, right/wrong (even as that which gives rise to the relative human realm is itself the stuff of the profoundly neutral, or absolute). The gift of human consciousness comes with the responsibility of exquisite stewardship, which means bringing awareness to the massively big picture that arises from within and is projected outwardly into the collective. While arising from and occurring within the absolute cosmic realm of no-preference or neutrality—we are designed to care very deeply, to preserve life, to love one another. It is hard-wired into our instinct to survive because our survival depends on it. The potential within us is to feel—exquisitely so—the nameless, timeless, unbounded, powerful expanse of love within and without that unites us with each other, all of life, and the eternal (there is no separation at all save for in the shadows of the minds of many) while we walk and breathe as humans on earth. It is that which builds bridges instead of walls and transforms me into we. That which calls our attention to our air, water, and land. This love vibrates from within the light and the dark. It loves unconditionally from its still, silent presence—one that is not perceived by awareness made dense from the sludge in our tissues from toxic chemicals in food or the environment, or a shortened attention span from over-externalization. It takes exquisitely subtle perception—one deliberately cultivated—to feel the immensity of it within the air we breathe, the ground upon which we walk, the leaves that shimmer and whisper overhead, the clouds dancing in the wind, the emptiness of the darkness of night. It can be heard in the haunting call of the owl from the nightscape, in the voice of the ancient that calls from the flute, and beckons in the beat of the tribal drum. The pure potential of all-that-ever-was-is-or-will-be vibrates within us already. It vibrates from within the light and the darkness. It is our birthright because we are it. The essence that is hard-wired into every aspect of our being—one that begs our knowing—becomes obscured within the shadows when the balance of the light and dark are not maintained. It becomes obscured beneath the toxic load in our tissues, and beneath psycho-spiritual-mental distortions that give rise to fear, mistrust, misdeeds, and have been passed down generationally through our ancestral lineage for millennia. These obscurations are, breath by breath, threatening humanity’s shelf life. What lies hidden within the shadows of the landscape of humanity (not in a bad or wrong way, simply in a it’s-how-it-is-way…what we arise from is as profoundly neutral as a parent is about which child wins the chess match) has the power to destroy human life and with it a lot of other life. We are on that trajectory. What is obscured within the shadows within is the highest form of invitation. Bringing our subtle awareness into the temple to discover what is there is no small task. It is however what is required. Not when there is not enough oxygen in the biosphere to support life as we know it any longer, but now. We’re perpetuating a collective that is not, on any level, sustainable. It requires shining a light on what is happening both within and without. Looking at how our practices—choices we make daily that are often unconscious ones—are impacting one another and our beloved Earth (on whom we rely for survival) and all of her life. It requires choosing to wade into the deep discomfort within that many aren’t aware is present due to over externalization and a gross perception (as opposed to subtle) that prevents conscious contact with or awareness of it. The process of staying with (which is maintaining awareness within the uncomfortable contractions, tensions, or other sensations that occur in the chest, belly, or wherever they show up and/or maintaining awareness on the sensations of the inhale and exhale, in a continual return from thought or rumination back to the sensations of body or breath from which arises deep wisdom with regard to mental habit patterns and energetic patterns buried in our tissues) is how the powerful muscle of awareness is cultivated into our ally. This process is the alchemization we seek. Our presence literally is our superpower. A very wise person once said that if you turn a light on in a dark room the darkness must go away. Within the womb of darkness germinates the miracle of new life, the ground of infinite possibility. When we uncover what lies hidden in the shadows we can no longer project blame, dissatisfaction, or responsibility for “the way things are” onto other. At the level of totality there is no such thing as self and other. When mired in thick underbrush reality appears a certain way. When liberation occurs such that one is afforded the internal freedom to walk from the underbrush to the top of a distant peak, reality is drastically altered. So it is within as what lies in the shadows is illuminated, liberating us from ancient chains. Whether or not it is apparent from your perch, our shelf-life on earth is at stake. At the level of the absolute (from whence we’ve come)—the level of the cosmos, black holes, burning stars, and birthing galaxies—whether we survive here for any duration is of no consequence. It is however hard-wired into our DNA to care very much. To care for the air, the land, the water, the animals, and each other. To build bridges, not walls. If your child, parent, friend, or animal was trapped in a burning house I am quite sure that it would get your attention. If you saw the firemen doing nothing as the house was actively burning around your loved one (or unknowingly fanning the flames), would you stand far away and do nothing, or might you move much closer to investigate your role to assist your loved one from the burning fire? We are there. Our loved one in the burning house is each of us, our brethren, and all the children yet to come. We are in this together. We decide how our precious human story unfolds, consciously or unconsciously. We keep the balance of light and dark. Darkness is not an enemy, not something to be battled. It is the place where the germination of the miracle of life occurs, where life is brought to light. We decide what germinates there. No one else. It is time to open fully to the shadows present within in order to bring light to the shadows that are seemingly without. It is time to stop looking outside and damning others for what lies within their shadows, which is merely a reflection of our own. Though uncomfortable, this journey alone is what reveals to us the essence of what we are. It requires getting up close and personal—aye, inhabiting for as long as is required—the places that feel painful and contracted within. There is no quick fix here. It is indeed a very exciting time to be alive. The potential is rife with infinite possibility. The miracle is already here now. We chose this. The responsibility that came with the gift of human consciousness ought to be taken very seriously. The alchemizer is our presence. It is cultivated in silence, in stillness. Just like splashing the dark water to reveal the exquisite phosphorescence inside. When our still and quiet presence inhabits the painful parts and the shadows (our own and others) patiently, persistently, and without judgment, the phosphorescence within illuminates itself. Every time we bring our awareness, our potent consciousness from thought, from rumination, from judgement, projection, or transference back to what is occurring within, the splashing phosphorescence grows stronger, bigger, and shines brighter light and more love. Hairballs of mental and physical distortion untie themselves as new mental pathways are laid. The thinking mind doesn’t give us the flashlight for the journey within. This journey creates the healing that we so desperately need and want. Since the past, present, and future are all happening now, solutions to what we face are already here. A gift of being human is the ability to begin again, right now. When humanity is gone, the earth—with her powerful life-force—will, over millennia, begin the slow process of repair. I suspect fungi, the mycelium, and the anaerobes will clean up the catastrophic mess we’ve created. New life will emerge from our darkness. With the time we have left here, however long it may be, it is time to step up and act like the human family that we are. To assume the responsibility of stewardship of the earth, all of life, and each other that we signed up for with the gift of human consciousness. We are children of god, the alchemists so delicately weaving the balance of light and dark into our human story breath by breath. It is such a beautiful story, tragically so. On whom are we relying for our human birthright to love one another beyond borders, to care, to protect our earth, to survive? Perhaps it is time to spend quiet time in nature, in front of a candle, going within the temple of being and receiving the powerful guidance that percolates from the ethers when things quiet down there. Your human tribe is here with open arms, eyes wide open, and unconditional love. Believe in yourself because the power of creation is within you. When out of the light of understanding of our awareness, our power can distort and create mental patterns that wind into hairballs of self-doubt, mistrust in the all-that-is, deep fear, cynicism, and result in the unconscious destruction of our planet, life, and each other. When that power is brought into the light of our awareness, our presence alchemizes those hairballs and contractions into the love that we are, and the experience of peace and unity with all of existence which looks very different from one of our present trajectories. This is one of the infinite possibilities present within the ground of potent bedrock within us. We need each other as we unfurl our human story breath by breath. If you need guidance or resources, reach out. the light therein the shimmer of distant stars. do not turn from me. Open to the winds of change blown in from the farthest reaches of eternity. Dig deeper into the place where it stirs you. even as it slays you in your surrender. of all who have drawn the breath of life. You call me wife, mother, daughter, sister, friend, teacher, healer, nurse, student, wayfarer, servant, master. with the gift of my consciousness. “One who conquers herself is greater than one who conquers a thousand in battle,” he said. The righting happens in every inhale, exhale. It is cultivated in the field of silence within that underlies and births existence. It is open to those who surrender distraction and face the fear teeming beneath the surface. requires each of us sing a new song. my crown open to the heavens. even as they tremble in their knowing. as my sword one-pointedly slays distortion. Pause with me for an infinite breath. This is not for tomorrow. Bring your sadness, grief, pain, fear, anger, hatred, doubt, cynicism, sarcasm, mistrust, misdeeds, disillusionment, denial, projection, assumption—ay, bring your guns, knives, and weapons of every kind. so the unseen can burn it clean. deep within the belly of mankind. beckon in the voice of the ancient. Our heart and drum no longer beat silently. Trust that when it is time for the next step, that foot-place will be illuminated. It is not necessary to see the entirety of the path ahead. Sometimes it is a step of action, of doing. Sometimes the step isn’t a step at all, but a place of gentle abiding in the potent alchemical germination that occurs in the darkness, under the surface. This is a place of great patience, of resting in what may feel like uncertainty. For the seed to become a sprout that becomes a great strong tree, this resting-in, this abiding, is essential. Don’t discount the stand-still or grasp haphazardly in response to the discomfort that not-knowing, or uncertainty, can bring. This can obscure the guidance. Rest in the unknown like the fertile ground of potential that it is. The medicine is here. Pure abiding presence fertilizes the deep, rich, dark soil. Trust. The illumination is the step that pulls your heart toward it, the one that inspires you, has your being feeling a whole body yes. It isn’t the one that leaves you feeling contracted within. The sharper the awareness, the louder and clearer the intuition, or illumination. The cleaner and more-tended the temple of the body, the more apparent the illumination. This is simply how it is. That guiding inner compass is there. Visualize a path in a dense forest on a dark night. When it is time for the next step, that foot-place will illumine itself if one is in attendance. The trusting, the patiently abiding in the unknown, the uncertainty, that is the invitation. The inquiry. The practice. Go deep within. It is from there that the what-is and what’s-to-be emerges. At times the intensity of our emotional and felt experience is such that we have the sense of being adrift. The sense of being in a lifeboat alone in unchartered waters without a rudder to steer us, or even any sense of where we’d go if we had a rudder for steering. During times like this there is a substantive question mark planted squarely over our hearts that says, “huh?” with regard to where we are and where we’re headed. To say it feels uncomfortable is putting it mildly. We squirm in our skin. We often feel foreign to ourselves, wondering where the ever-sturdy, clear-hearted version of ourselves went. If we check in with ourselves, we might sense thick feelings or sensations in our chest, our heart center, or our belly. It might feel like an ache or a contraction. If we sense more deeply into these sensations—a gentle, quiet return—we might realize that there is deep sadness or grief therein, that when met with the gentle return of the light of our awareness, bring tears of release. Fear not. This is a powerful place to be that calls for showing up differently. When the old M.O. fails to serve us, a vaster intelligence is at work. Thank goodness this intelligence is encoded in our DNA. It vibrates in our cells. It informs our hearts. It is, in fact, all that ever was, is, or will be. It has the power to stop us dead in our tracks, which is ultimately for our benefit, though it can, at times, feel like an evisceration. What do we do when we find ourselves feeling adrift? We hang tight, gently and quietly. We give ourselves the space we need in our lives to accommodate our unfolding, which may mean permission not to make plans or show up for others like we usually do. Being selfish is a great act of self-love that is absolutely warranted and needs no permission save that which we give ourselves to tend to the garden of our being. We let go of ways that keep us tethered into the old M.O. … ways of avoiding our experience that include binge-watching episodes, social media, internet, cell phone, and reliance on others for our validation and sense of direction. We rise in the unknown of our experience. It’s like being in a chrysalis. Transformation happens to the extent that we show up for it. A wise man once said that if you turn a light on in a dark room the darkness must go away. Lucky for us our exquisite awareness—that which is in continuum with all of eternity—is the only light we ever needed for this journey. When we cultivate it, we can use it for our benefit, for our growth. We bring it gently within to that which feels painful, contracted. Maybe to the areas in the heart center, the chest, the belly, or wherever they may be. We show up with this exquisite light with which we were gifted without any labels or story. That means dropping whatever we think we know about the experience despite how convincing or seductive it seems. We show up with just the purity of our awareness. We leave behind any story that suggests that the pain, grief, sadness, doubt, or uncertainty is caused by ourselves, a situation, or a person. We let any sense of self-doubt that arises because of these feelings just be. We leave behind the old pattern that has us feeling less-than, damaged, or as if “something is wrong with me” because of the feelings. We stop trying to plan because being in the chrysalis is so uncomfortable that we spin our wheels in attempt to be elsewhere. We simply show up with the powerful light of our awareness, of our being. We bring it to the painful parts. We breathe into them, making our breaths deeper and longer such that they reach the depths of the belly. We stop talking and let ourselves have the experience of that which feels staggeringly uncomfortable. Maybe we gently move our bodies if our deepest intelligence calls for it. We keep returning to the experience when we realize that the light of our exquisite awareness—the only balm we ever needed—is drawn back into story about the experience, spinning our wheels in self-doubt or planning ourselves out of it. We do these things not because we’re trying to change ourselves, but because that is what is warranted. A mother doesn’t hold and rock an infant because she is supposed to, needs to, or because she wishes the child be different. It is simply called for. We keep returning. One of the single greatest gifts of being human is the ability to begin again, in any now in which we find ourselves. We always have the choice to begin anew, which isn’t something we should take lightly. It is profound. We can choose to gently and quietly return to that which has us feeling adrift and be with ourselves in a new way. We can be with ourselves in such a way that we no longer doubt ourselves and kick-and-scream when we feel the intense pain or discomfort of sadness, grief, anger, or uncertainty. That was the old M.O. We can instead usher in acceptance, allowance, and radical self-love for the entirety of our experience, which ultimately allows for our unfoldment, our transformation in the chrysalis of being. We are absolutely stronger than we think. There is always a choice, however it requires slowing down and greater care. It requires time alone, and cultivation. It requires finding the legs to stand squarely in the face of self-doubt and beam the brightness of our being, our awareness, deep within the shadows of our nooks and crannies. We are fortunate that we were equipped with all that we ever needed for this at-times difficult journey. Giving ourselves what we need for our chrysalis-time is imperative. Rest assured that if you hang in there and tend to the chrysalis, a time will come when you look back and realize that you were never adrift. You were being given the opportunity to dig deeper and cultivate trust in unchartered waters. Growth is rarely comfortable. The inner landscape is the vastest and most mysterious of them all. Some of it is bathed in light so bright it is blinding. Some of it is enshrouded in darkness impenetrable to untrained eyes. There are parts worn soft and smooth over time by sacred awareness, or presence, and other parts ragged, sharp, and steep. There are meadows and valleys, canyons and chasms, through which tears flow and cosmic winds blow. Every inhale and exhale a wave from the grandest of oceans, continually bathing the shore of being. The yearning to know this land is an unnameable longing, a silent call from the depths. To know our infinite nature, we must turn our eyes inward...and be willing to be blinded by our light, and cut by that which is sharp within. It is a journey that brings us to our knees and gives us wings to soar. That which we seek flourishes from the compost of our terrain. The single most sacred pilgrimage you will ever make is the one right where you are. less spiritual, or less profound. The goal never was happiness. like anger, grief, and uncertainty. It was never a place of permanence. Now that is our salvation. Right Now is the teacher, the guide, the spiritual adviser, the priest. in your gut, in your chest. and it is the key to our salvation. 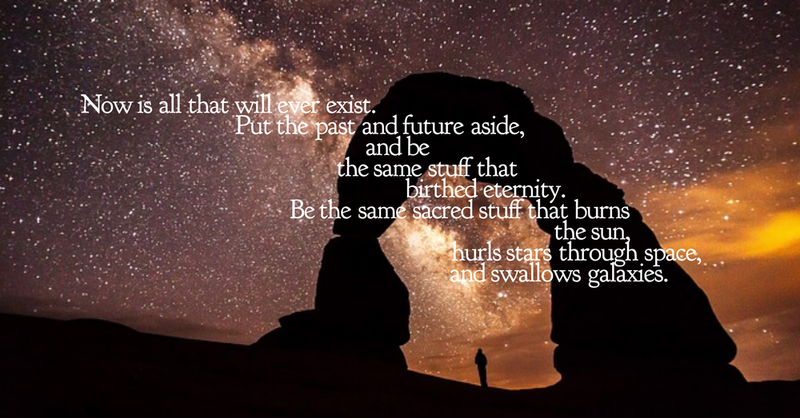 Now is all that will ever exist. Birth and destruction are inherent within us.